Thanks for visiting our site. 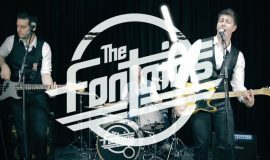 We are Phil, Peter and Anthony, three experienced musicians that make up The Fontains, the north east’s most popular alternative wedding band. What started out as friends playing the songs of their favourite artists has, for good reason, snowballed into the successful business you see today. It makes us feel old saying it but there’s over 70 years of playing and experience between us. In our time we’ve toured with original acts playing acclaimed venues like The Cavern, King Tuts and academies up and down the country but fast forward a few years and you’ll now find us at country houses and grand halls filling dancefloors and making memories for the countless couples. To help your party reach its potential we bring to it a wealth of experience and knowledge that only years of gigging can bring. Our large repertoire has been perfected over time allowing us to tailor a set list as diverse as your dancefloor. We’ve played just about all the wedding venues in the North East so we know the arrangments, we’re familiar with the set up and have sussed any quirks your venue may have. In addition to all this we’ve also built up an impressive sound and light rig and acquired the knowledge needed get the very best from it. As we often like to tell people, when we started out all those years ago it wasn’t with the intention of becoming a wedding or function band. We simply set out to have fun doing what we loved and it was probably that approach that got people asking us to play their weddings and to where we are today. So if you share our passion for great music played well and 100% live then please get in touch so we can quote your event.